What I’ve Been Up To Lately + Update! 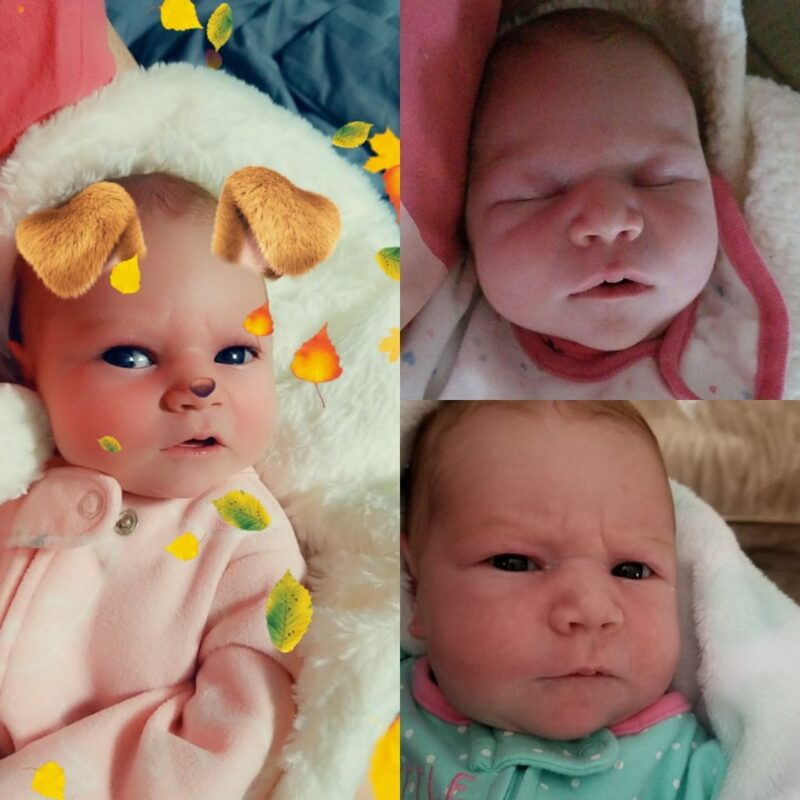 Well, I’m very excited to share that my little girl, named Ariella Kristen Freeman came into this world on November 3rd weighing 7lbs 1 oz with lots of strawberry blonde hair and quite the set of lungs on her! She has taken up all of my time since then and I’m now slow-ly trying to figure out how to set time aside for myself again to work on updating my blog and creating new videos. Halloween was an exciting time for me as I was not only very anxious for her arrival and was hoping that she would be a Halloween baby but, unfortunately that didn’t happen, although, November 3rd is close enough. But I tried to get back into the swing of creating video content for my YouTube channel. I was able to post 2 videos before Ariella came into my life and I’m very happy that I was able to do that, although I wish I could’ve been able to put out more. Writing has always been an easy thing for me and what made me happy about these videos was that I was able to share a side of my personality that I didn’t really reveal when I rebooted my channel back in the winter of this year. I’m quite shy and introverted when I meet new people and talking to a camera makes me feel even more shy and nervous but I was able to let that go and really be myself. This is partly because I knew I wanted to take advantage of being on maternity leave but I also joined the second bootcamp that Erika Vieira launched this year called Zero to Influence. These bootcamps aren’t cheap, so I knew going in that I had to take this very seriously and use the bootcamp to help me better my channel and what I bring to the YouTube community. I would love it if you guys checked out my most recent videos! 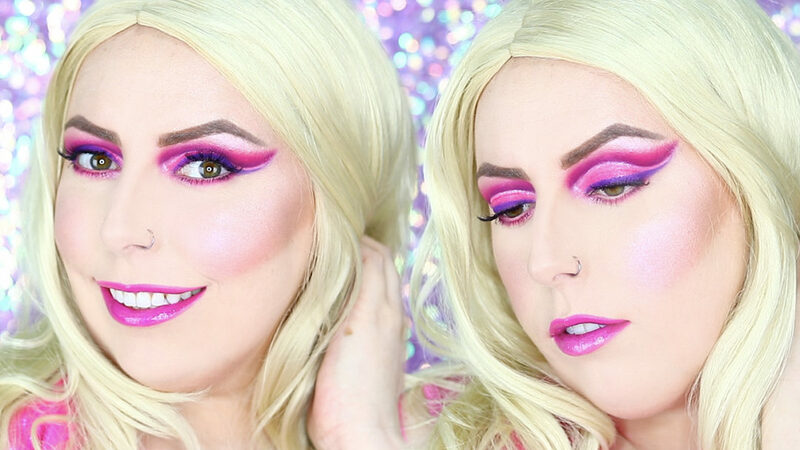 Even though the first one is more geared towards Halloween, it’s really good for a laugh and the other one is a makeup look that I feel could be used any time you want to look really extra! I shot a video the day before I got induced to have Ariella and will try my best to get that up for you guys as soon as possible! And then I’m going to try to be as strategic with my time as possible while working with Ariella’s schedule that she has for me in order to start working on new content again. I love Halloween so much but I also really love Christmas and all of the creative looks that are perfect for this time of year, as well as all of the great makeup collections that come out at this time! So stay tuned for that and let me know what you think of my videos and any requests or ideas for content that you’d like me to work on! Well, hello.. Dolly! 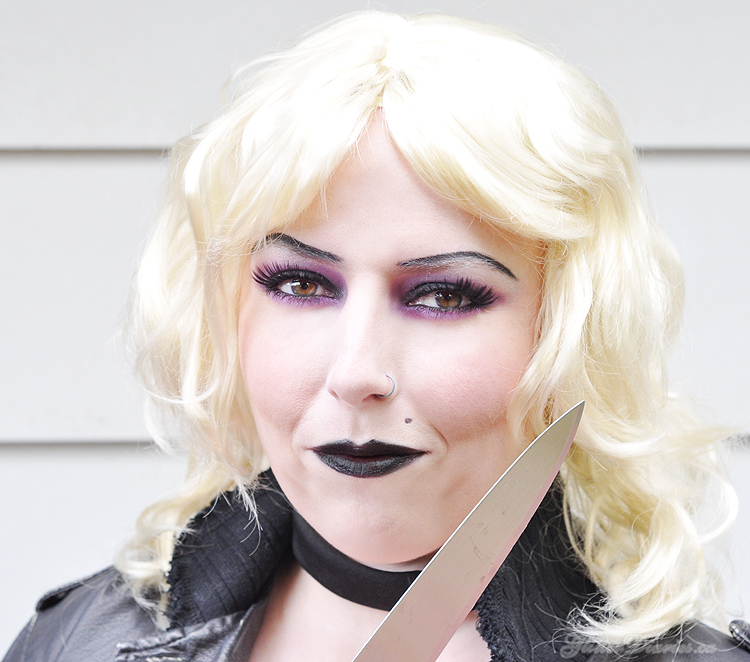 The idea of doing a look based on Tiffany from the Bride of Chucky has been on my mind for quite some time. So I thought this was the perfect year to include it in my Halloween Makeup Tutorials! I crafted this look together twice before coming up with the best and easiest way for anyone to recreate it. 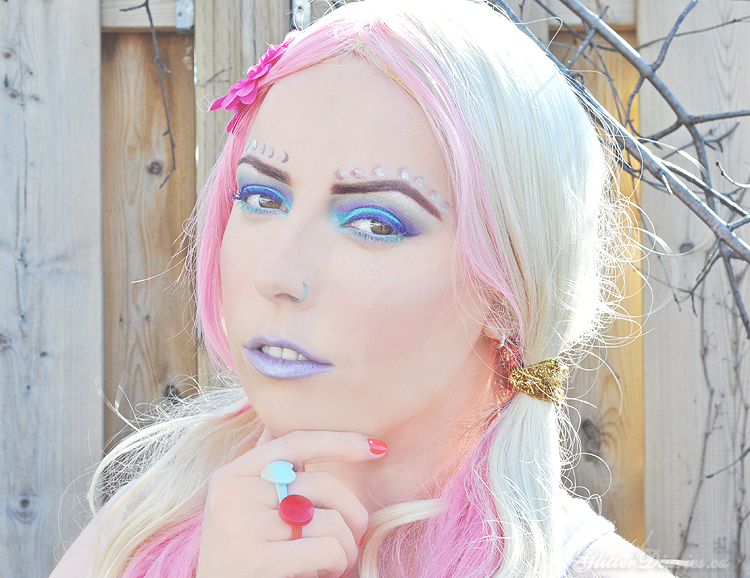 The original plan included covering up my brows completely, but I decided to go with a pale shimmery shadow instead that I blended into the brows that faded their colour, so they didn’t stand out as much. This is an easier trick, if you have thin brows and you’re not comfortable with applying glue to your brows to flatten and cover them up. First, apply a black cream base to your lids and in your crease. Apply a raspberry pink shadow (I used blush) into your crease with a fluffy brush. Apply a pale shimmery pink to your brow bone and into your brows. Place a matte black shadow to your lids and blend into your crease. Line your upper and lower lash lines with black liner. Put on some flirty, spiky lashes. Apply a black pencil to the top of your brows and follow along to create penciled in thin brows. Mix a light foundation and an illuminator and apply to your face. Use a contour stick and accentuate the top of the bridge of your nose, your cheeks and smile lines, and create dimples below your smile (if you don’t have them). Add beauty mark to your upper lip with a black pencil. Apply a shimmery pink blush to your cheeks and a soft champagne highlighter to your forehead, cheeks, nose and chin. Add a black lipstick to your lips and you’re done! 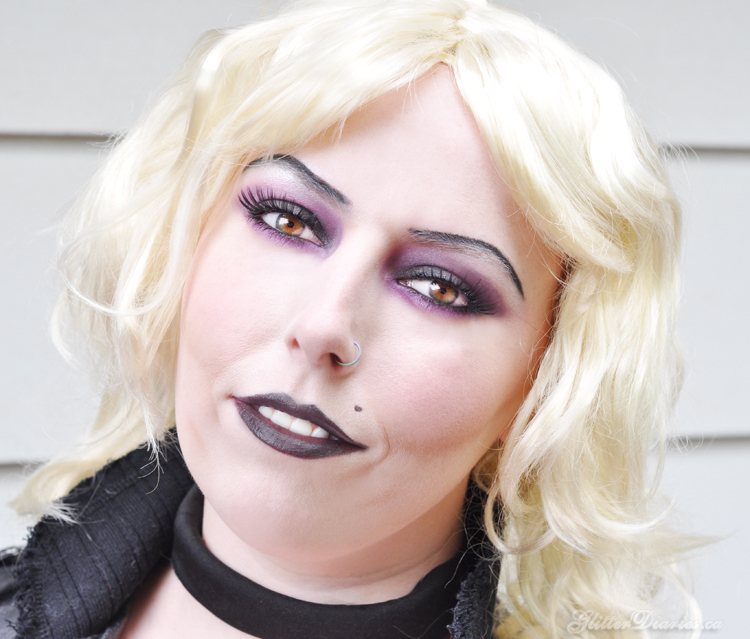 What do you think of the Bride of Chucky Tiffany Halloween Makeup Tutorial?! Share your thoughts below! Disclosure: Products marked with ‘*’ have been provided for editorial and makeup look consideration. “Though I know I should be wary, still I venture someplace scary, ghostly hauntings I turn loose: Beetlejuice, Beetlejuice, Beetlejuice!” I’ve loved both the movie and TV adaptation of Beetlejuice for as long as I can remember. 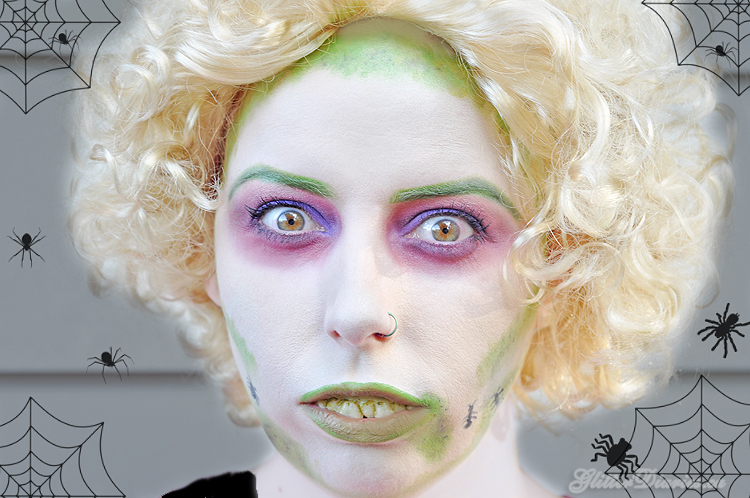 So, it was an obvious decision for me to create my own Beetlejuice Halloween Makeup Tutorial. Start off by creating your eye look by applying a reddish burgundy to your brow bone and following along your orbital bone below your eyes. Add a pale ivory to just below your brows for a bit of highlight and then continue on by applying a purple to your lids. Add a deeper purple to your crease and along your lower lash line for depth. Carve out your brows with a green cream colour and add some brown throughout for a bit of depth, then finish off your eyes with mascara. Apply a grey cream colour to your face and then set with a white or pale cream powder. Use the same green used on your brows and apply it to your hair and jaw line, corner of your mouth and as a “mossy” contour with a small stippling brush. Add some texture by putting some yellow and brown cream on top of the green to create more of a mossy/mildew effect. Draw some cute bugs on your face for some extra, gross fun. Apply the green cream to your lips and add a bit of the brown cream to the inner portion. Finish off the look with a set of grotesque teeth and a ratty looking blonde wig and you’re set! 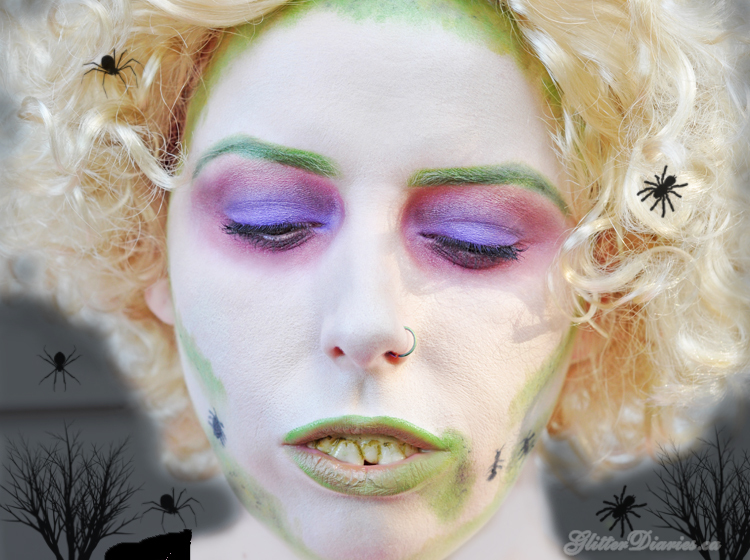 Be sure to look out for my next ghoulishly exciting new Halloween Makeup Tutorial next week! 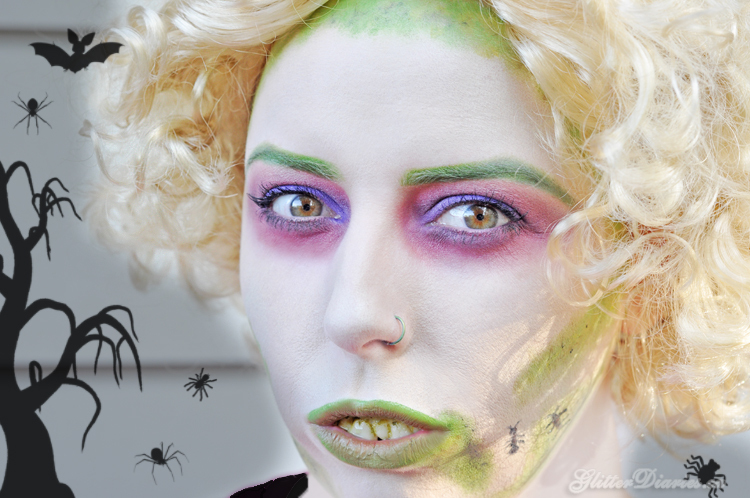 What do you think of my Beetlejuice Halloween Makeup Tutorial? What will you be going as for Halloween this year?! Share your thoughts below!